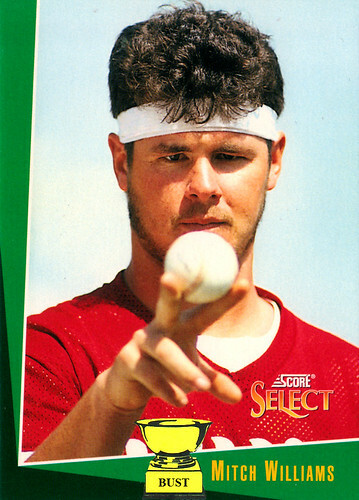 Mitch Williams' train of thought from 12:11 to 12:13 p.m., March 2, 1992: "God, how long is this photo shoot going to take? I've been staring at this baseball for, like, 20 minutes. At this point, I'm more intimate with it than I was with the last girl who got this grip. ... Ugh, why did I go with my tightest headband? The top of my head is numb, and I think the my upper ears are starting to chafe. ... Ah well, at least my hair looks good. No, wait. At least my hair looks great! It's pitched forward farther than I was the last time Kruk and I split a case of Schlitz. ... Thank Christ, he finally got the shot. Ah crap, I can't move my fingers!"